This booklet is the first of a series of essays based on a series of talks that Tim Keller gave in Oxford, England at the Oxford Town Hall, England in 2012. 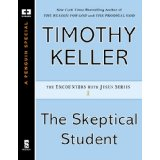 Based on John Chapter One Keller gives a reasoned exposition of the passage with special attention given to Jesus’ encounter with Nathanael and walks us through his problem as a skeptic, his need as a skeptic, and the prescription for a skeptic. Keller bridges the gap between the biblical text and the modern day skeptic and shows how Jesus as the Divine Logos is the only one that can truly meet the skeptics greatest problems and needs. In exchange Jesus offers the skeptic a purpose for living, and an eternal hope. Central to the theme of the essay Keller articulates the essence of Christianity. All other religions focus on what you have to do – works. Christianity on the other hand is the exact opposite. Jesus Christ came to earth in order to do for us what we could never accomplish for ourselves – the perfect life required by the Law. This short read is an excellent introduction to the gospel – the essence of Christianity. It is an open invitation for skeptics to be open enough to evaluate the claims of Jesus Christ from the Gospel of John and to respond to his offer of purpose and meaning in this life, and the offer of eternal life with Him in eternity.